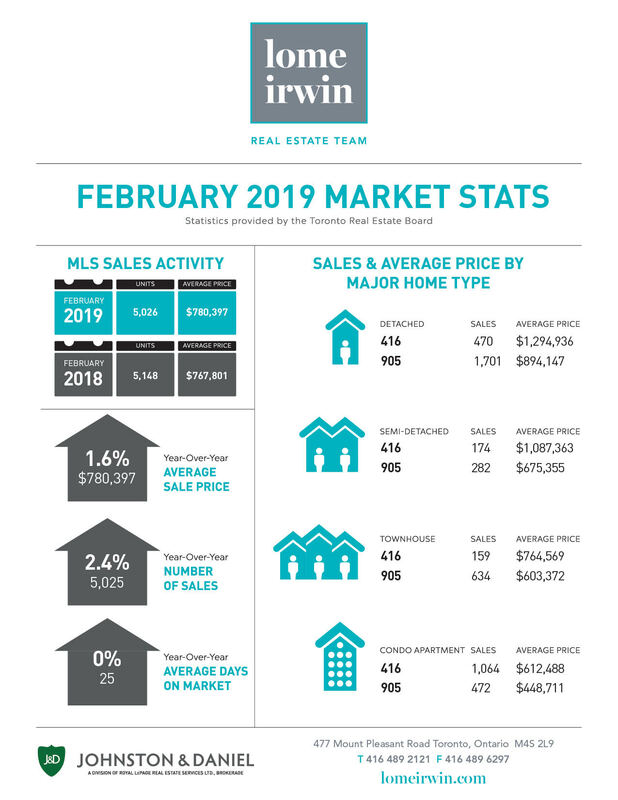 Greater Toronto, March 5, 2019 – Toronto Real Estate Board President Gurcharan (Garry) Bhaura announced that Greater Toronto Area REALTORS® reported 5,025 homes sold through TREB’s MLS® System in February 2019. This sales total was down by 2.4 per cent on a yearover-year basis. Sales were also down compared to January 2019 following preliminary seasonal adjustment. “The OSFI mandated mortgage stress test has left some buyers on the sidelines who have struggled to qualify for the type of home they want to buy. The stress test should be reviewed and consideration should be given to bringing back 30 year amortizations for federally insured mortgages. There is a federal budget and election on the horizon. It will be interesting to see what policy measures are announced to help with home ownership affordability,” said Mr. Bhaura. Despite sales being down year-over-year, new listings actually declined by a greater annual rate. This suggests that market conditions became tighter compared to last year. Tighter market conditions continued to support year-over-year average price growth. Both the MLS® Home Price Index Composite Benchmark and the average selling price were up modestly on a year-over-year basis in February 2019. The MLS® HPI Composite Benchmark was up by 2.4 per cent year-over-year. The average selling price for all home types combined was up by 1.6 per cent over the same period. Price growth was driven by the condominium apartment segment and higher density low-rise home types. On a preliminary seasonally adjusted basis the average selling price was down compared to January 2019. “Home sales reported through TREB’s MLS® System have a substantial impact on the Canadian economy. A study conducted by Altus for TREB found that, on average, each home sale reported through TREB resulted in $68,000 in spin-off expenditures accruing to the economy. With sales substantially lower than the 2016 record peak over the last two years, we have experienced a hit to the economy in the billions of dollars, in the GTA alone. This hit has also translated into lower government revenues and, if sustained, could impact the employment picture as well,” said Jason Mercer, TREB’s Director of Market Analysis and Service Channels.